This Nation Banned George Michael, Now it’s a Tourist Paradise . Albania is far from perfect.. However, I’m writing from the perspective of a tourist. 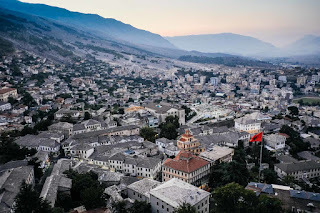 For short-term visitors, Albania is a land of ridiculously scenic beaches, postcard-worthy mountains, historic castles and towns, ancient fortresses, Roman-era ruins, the oldest lake in Europe, and a cool European capital city relatively devoid of tourists. The photos speak for themselves ... . For tourists, it’s a bit of a paradise here. Compared to almost any other country in Europe, Albania is inexpensive. Hotels are great value, and if you think about staying longer, you could purchase a new ocean-front apartment for about the same price as a Volkswagen. The Albanian Riviera was described to me, by an older man from France, as “Spain in 1970”. Quite the contrary – to date, the changes I have seen in Albania are great, and seeing a little more financial security in one of the poorest regions in Europe can only be good. But, I already feel a little selfish nostalgia knowing that the future will inevitably bring more and more crowds to Albania, and more of the raw natural landscapes will be blighted by the over-development of apartment blocks and hotels. For better or worse, it is, what it is. Things are changing in Albania.. But, it hasn’t always been this way. Freedom of speech, religion, cars, foreign travel, foreign investment, George Michael, and even beards, were all forbidden. Albania became the most isolated and poorest country in Europe, a land where citizens were more likely to know of someone living in a concentration camp than have a neighbour that owned a colour TV. Long story short, Albania isn’t like that anymore. Apart from regular concrete-bunker sightings and the occasional fading communist-era propaganda artwork, the casual tourist wouldn’t realise such tumultuous events occurred so recently. However, after experiencing around sixty years of grief, many Albanians got tired of waiting for “things to get better” and over the last couple of decades, they left the country, en-masse. The exodus hasn’t stopped – for example, in May of this year, more Albanians than Syrians sought asylum in Germany. The Albanian diaspora around the world is now larger than the number of Albanians living in Albania. Given the history, it’s not hard to understand this exodus – sixty years is a very long time to wait for a bunch of promises that never actualised. So, Albanians continue to leave, just as tourists are really starting to arrive.